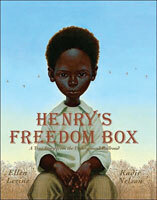 This is a wonderful book to use to begin a unit on The Underground Railroad. You can use this book to activate your students’ background knowledge about slavery and The Underground Railroad. Lesson Idea: Have students ask (and write down) questions about the topic of slavery and The Underground Railroad prior to reading the text. Next ask students to write down questions they have during reading. Read the text again and have students determine if answers to their questions can be found. Finally, have students write down any questions they still have after reading the text.